We're both huge nature lovers and try to go camping at least once a year. Getting out of the city to go hiking, canoeing, swimming, or just to relax by a campfire is a great way to decompress and revive your mind, body, and spirit. 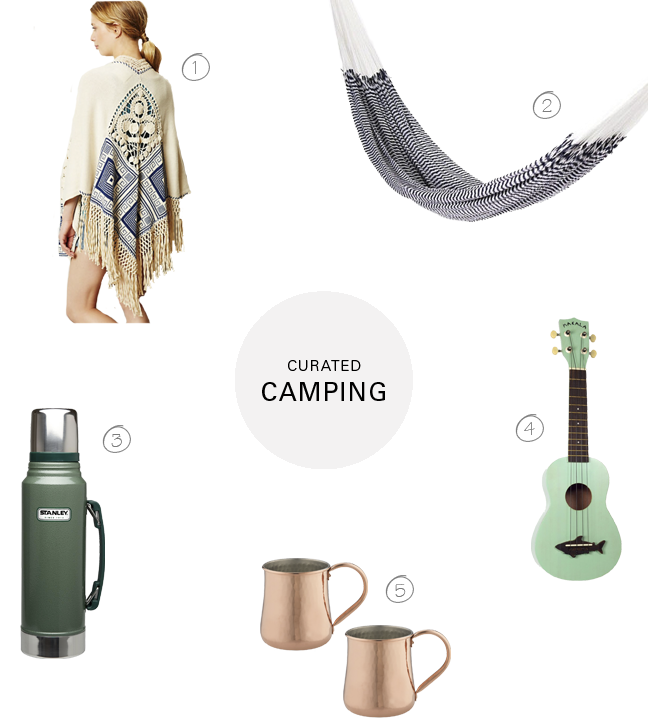 Here are a few items we always take camping and have found make the trip a little more enjoyable. 1. Chapala Poncho: When the sun goes down and the temperature drops, grab a poncho to stay warm. // 2. Natural Cotton Hammock: A small lightweight hammock is essential for any camping trip. Find two trees by your site, hook up your hammock, read a book, and enjoy nature! // 3. Stanley Vacuum Bottle: Whether you want to keep a beverage cold or hot, bring a vacuum bottle so you can stay hydrated on the go. // 4. Makala Ukelele: Bring an instrument to play music and have a singalong around the camp fire late at night. This ukelele is small and won't take up much room. Perfect for camping! // 5. Copper Mugs: Make an afternoon cocktail at your campsite and keep it cool in these handmade copper mugs. Our favorite: a Moscow Mule. Yoga pants are a camping must! They always make it into our packed bag as well.